Last Monday’s NASCAR Sprint Cup race at Pocono Raceway was full of surprises, both from Mother Nature’s disagreeable weather and in Victory Lane. 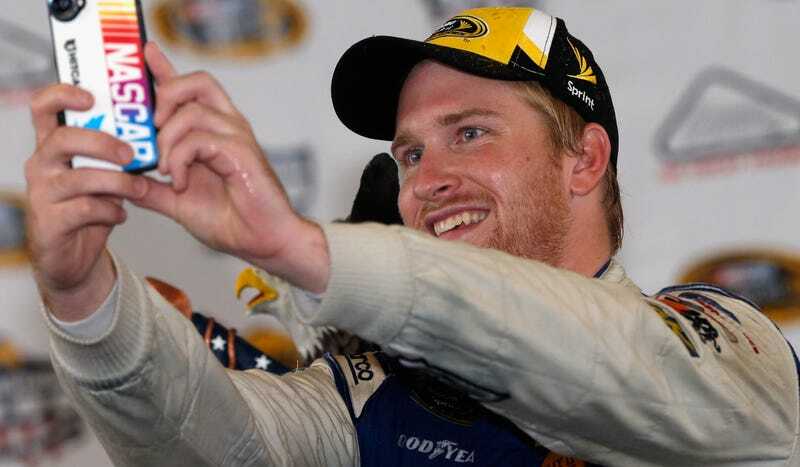 We spoke with rookie Chris Buescher to how one lucky strategy call gave him the surprise win of the season at Pocono. Buescher was a true underdog heading into Pocono, not only as a rookie to Sprint Cup this season, but driving for the smaller Front Row Motorsports team. The last time a Front Row Motorsports car won was 118 races before Pocono this year, according to NASCAR. That being said, he’s been looking to prove himself that he’s ready to compete in Sprint Cup. Buescher won the ARCA Racing Series championship in 2012 and the Xfinity Series—the step right below Sprint Cup—championship in 2015. Imagine his surprise to win in his first year of Sprint Cup, then. Apocalyptic-looking, race-ending fog rolling into Pocono. Screencap via NASCAR. Last Monday, Mother Nature provided the perfect conditions for the unexpected to happen at Pocono. Any number of things can “lose the track.” Rain would force everyone into the pits, as NASCAR doesn’t have rain tires for its oval races. In Pocono’s case, heavy fog limited visibility so much that it ultimately shortened the race. Once the race was going, Buescher felt as if his Ford Fusion-bodied race car was good for at least a top-15 finish, and a wild strategy call meant that he was at the front of pack when the race was called off. At first, Buescher was running the same strategy as most of the pack, but then, as tends to happen in jam-packed NASCAR races, his car got hit. The “lucky dog,” as it’s dubbed, is where the first driver running one lap down gets put back on to the lead lap during a caution flag. To work his way back through the rest of the field, Buescher’s team made a bet on running a bit more fuel that paid off due to the shortened race. 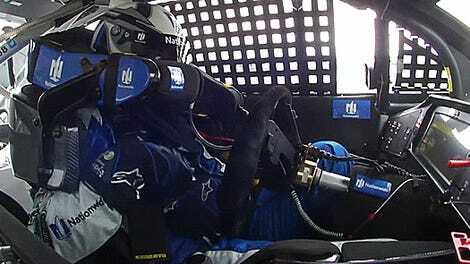 “We pitted and had a little bit more fuel than the rest of the guys out there, Buescher said. “When it came down to what would have been the last stop of the race most people were starting to hit pit road, we decided to run it out, and basically say let’s go as far as we can on this fuel window. For everyone who loves to see a good upset, Buescher’s win proved that upsets still happen even in Sprint Cup. All you need is something to shake things up—in this case, weather—and you’ve got a race that seemingly anyone can win, at least when a team is willing to throw its weight behind what turns out to be a lucky bet on strategy.